Kid's Art Supplies. Madison Art Shop is committed to enlightening children through artistic expression. We have a wonderful selection of kid’s art supplies available for affordable prices. A children’s easel and a beginner’s set of children’s art supplies is all you’ll need to nurture their creativity and compel them to produce masterpieces. The wide selection of kid’s art supplies at Madison Art Shop includes equipment specifically designed and sized for children. In addition to our children’s easels, drawing desks, and art tables, we offer unique art supplies like building blocks, loom sets, playhouse theaters, sewing kits, and much more. Offering a variety of artistic tools will allow them to push mental boundaries and explore their limitless creativity. Why is art important for children? Studies show that art instruction of some form aids in childhood development. Through art, children tap into their excess creativity and find a healthy method of release. Research suggests that regular artistic activity counteracts stress and boredom, leading to a calmer, more obedient, and better behaved child. In addition, this activity supposedly leads to healthy, well-adjusted mental development. Children who regularly engage in creative activities are shown to feel more in touch with their emotions and display higher self-esteem, which influences performance and success later in life. Finally, art may enhance dexterity and build critical-thinking and problem solving skills. The younger you introduce children to art, the sooner these effects are predicted to take place. How can I incorporate art into my child’s life? It is easy to pique a child’s interest in art, especially when they’re younger. The important thing is to open up your mind to the many things that constitute “art.” Gluing Popsicle sticks together and decorating with glue and glitter is just as relevant to artistic expression as sculpting a masterpiece. The only difference is experience. Children love new toys and gifts, so start by surprising your child with a children’s easel and basic set of children’s art supplies. These sets often contain several media like crayons, colored pencils, pastels, markers, and water colors. 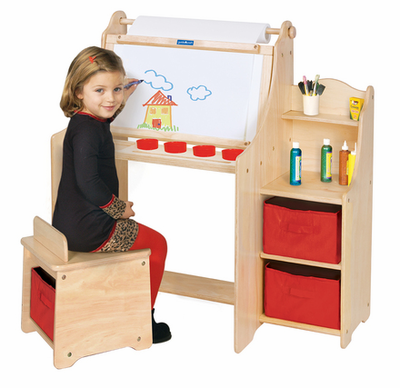 Your child will most likely begin experimenting on his or her own with the contents of the supply set and the easel. Always respond to an artist’s first works with praise and positive feedback. This will build self esteem and influence continued participation in artistic practices. Once you have captivated your audience, introduce your child to different media like paper mache, crafts, looms, and anything else that comes to mind. This will be a wonderful bonding experience for both of you and your child will benefit from enhanced mental development. If you have any questions about our kids art supplies, or would like recommendations for fun and unique art projects, don’t hesitate to contact our customer service representatives. They will be happy to assist you and help you brainstorm.